More than 1500 fossils from the Rising Star cave system in South Africa have been assigned to a new human species, Homo naledi, which displays a unique combination of primitive and derived traits throughout the skeleton. When the recovery of fossil hominin remains from the Rising Star cave system near Johannesburg in South Africa was widely publicised in 2013 and 2014, I'm sure I wasn't the only one who thought that the coverage had more hype than substance. But now, in two papers in eLife, we can see what the fuss was all about as Lee Berger of the University of the Witwatersrand, Paul Dirks of James Cook University and an international team of colleagues report the discovery of more than 1500 fossils that represent at least 15 individuals (Berger et al., 2015; Dirks et al., 2015). These remains have now been assigned to a new human species, which has been named Homo naledi. However, despite the wealth of information about the physical characteristics of H. naledi that this collection provides, many mysteries remain. How old are the fossils? Where does H. naledi fit in the scheme of human evolution? And how did the remains arrive deep within the cave system? In the first paper, Berger et al. describe how the collection displays a unique combination of primitive and derived characteristics (Berger et al., 2015). 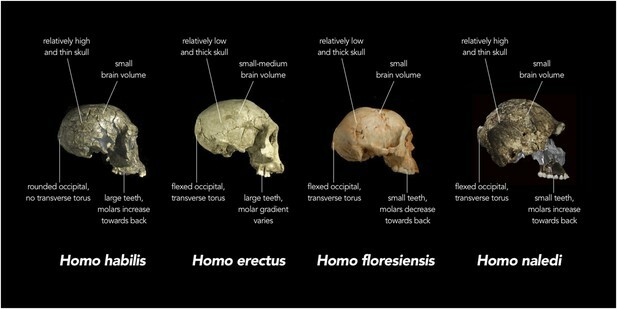 For example, the small brain size, curved fingers and form of the shoulder, trunk and hip joint resemble the prehuman australopithecines and the early human species Homo habilis. Yet the wrist, hands, legs and feet look most like those of Neanderthals and modern humans. The teeth have some primitive features (such as increasing in size towards the back of the tooth row), but they are relatively small and simple, and set in lightly built jawbones (Figure 1). Overall, to my eye, the material looks most similar to the small-bodied examples of Homo erectus from Dmanisi in Georgia, which have been dated at ∼1.8 million years old (Lordkipanidze et al., 2013). However, the rich H. naledi sample includes bones that are poorly known in other early humans species such as Homo rudolfensis, H. habilis and H. erectus, so it is difficult at the moment to assess how similar these species were throughout the skeleton. Replica crania of (left to right) Homo habilis (KNM-ER 1813, Koobi Fora, Kenya ∼1.8 million years old), an early Homo erectus (D2700, Dmanisi, Georgia ∼1.8 million years old) and Homo floresiensis (Liang Bua 1, Indonesia ∼20,000 years old) are compared with actual fragments of cranial material of H. naledi that have been overlaid on a virtual reconstruction (far right; note some of the images of H. naledi material have been reversed). In each case, the crania are labelled with the typical features of each species. For example, while the adult brain volume of modern humans (Homo sapiens) is typically between 1000 and 1500 cubic centimetres (cc), H. habilis ranged from about 510 to >700 cc, H. erectus from about 550 to >1100 cc, H. floresiensis about 426 cc, and H. naledi between 466 and 560 cc. Furthermore, in modern humans, the occipital bone (at the back of the skull) is typically evenly rounded in profile, whereas in some early humans such as H. erectus, the upper and lower portions of the occipital are sharply angled to each other (i.e., ‘flexed’), and there is a strong ridge of bone running across the angulated region (called a transverse torus). If H. naledi is more than 2 million years old, which Berger et al. suggest could be possible, the species might lie close to the very origin of the genus Homo. However, if the H. naledi fossils are less than 100,000 years old, it would mean that it survived until relatively recently, just like Homo floresiensis far away in Indonesia (another species which combines a small brain with small teeth; Stringer, 2014). Because H. naledi is currently only known from one site, it is unclear whether or not it was restricted to southern Africa. If it turns out that H. naledi was more widespread, its moderate body size may lead scientists to re-examine other diminutive fossils from across Africa, which have usually been attributed to a small form of H. erectus (Antón, 2004; Potts et al., 2004; Simpson et al., 2008). Frustratingly, the rich and informative H. naledi material remains undated. Given that this hominin material could conceivably even date within the last 100,000 years, I am puzzled by the apparent lack of attempts to estimate its age. This could have been achieved directly via radiocarbon dating (even if only to test whether the material lies beyond the effective range of that method) or indirectly based on ancient DNA samples. For example, after ancient DNA was successfully recovered from the Sima de los Huesos fossils, it was used to date them to about 400,000 years old (Meyer et al., 2014). Moreover, tests on even small fragments of bone and tooth enamel could have narrowed down the possible age range and at least ruled out either a very ancient or very young age (Grün, 2006). Even without date information, the mosaic nature of the H. naledi skeletons provides yet another indication that the genus Homo had complex origins. The individual mix of primitive and derived characteristics in different fossils perhaps even indicates that the genus Homo might be ‘polyphyletic’: in other words, some members of the genus might have originated independently in different regions of Africa. If this is the case, it would mean that the species currently placed within the genus Homo would need to be reassessed (Dembo et al., 2015; Hublin, 2015). While many have concentrated on East Africa as the key and perhaps sole region for the origins of the genus Homo, the continuing surprises emerging from further south remind us that Africa is a huge continent that even now is largely unexplored for its early human fossils. Proceedings of the Royal Society B 282:20150943. American Journal of Physical Anthropology 131:2–48. Paleoanthropology: How old is the oldest human? Chris Smith from the Naked Scientists interviews Lee Berger, John Hawks and Charles Misuba.